Guinness’s Estella Muzito(centre) shares a light moment with the Sevens’ players and management at Legends in Kampala. Photo by Shaban Lubega. 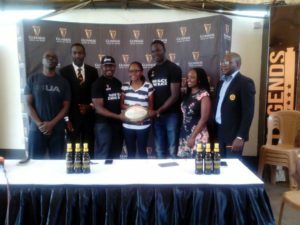 Ahead of next month’s Africa Rugby sevens tournament in Kampala, Uganda Breweries through their brand Guinness has invested Shs200m in the the two-day event. The tournament that will run from October 6-7 at Legends grounds will see nine other countries join defending champions Uganda for this year’s championship. “We are happy to be back for the Rugby and excited about the possibility of Uganda retaining the championship,” Said Guinness’ Estella Muzito. “We have sponsored Rugby tournaments before but this one is special because our country (Uganda) won it last year and it also serves as a qualification for both the World Cup and Commonwealth games. Uganda is in pool A along with Zimbabwe, Tunisia, Botswana and Zambia. Uganda beat up on Namibia 38-19 in Nairobi, Kenya last year to win its maiden championship. Mike Wandera, the sevens team manager, was full of praise for Nile Breweries and the national team. “It is great they(Guinness) have come on board and hopefully more companies can join them so that we have a successful tournament and may be retain the title,” Wandera said. “I am proud of the lads and the management and I have a good feeling going into the games next month,” he added. Uganda is seeking to become the first nation to retain the tittle since 2013. This also serves as Sevens qualifiers for next year’s World Cup in San Fransisco, USA and the commonwealth games in Gold Coast.